Sleeves, shoe covers, disposable sleeves, disposable shoe covers, boot covers, blue shoe covers, non-skid shoe covers, Tyvek shoe covers, PosiWear shoe covers, disposable protective clothing, chemical resistant clothing, disposable garments, personal protective clothing. Photographs of these fabrics are shown on our Coveralls page. Other protective clothing is shown on our Aprons , Coveralls , Shirts, pants , Shop coats , Sweatbands, hoods pages. 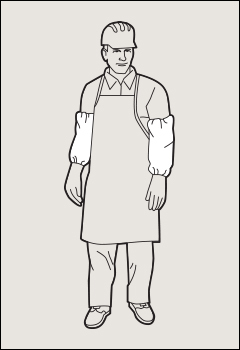 This style of sleeves is available in the following three fabrics. Comparisons of these and other fabrics are shown on our Coveralls page. Sleeves, PosiWear M3 proprietary SMMMS technology. 5 layers of protection providing a high level of breathability and protection against non-hazardous dry particulates and also water based light liquid sprays and splashes. This proprietary fabric uses the latest SMMMS technology–3 layers of filtering meltblown between strength providing spunbound polypropylene. Elastic at both ends, white. Sold by the case, 200 each (100 pair)/case. microporous material that resists small dry particulates and liquid spray. Provides a high level of protection against non-hazardous dry particulates, light sprays and liquid splash. Passes US and European standards for liquid barrier and bloodborne pathogens. Elastic at both ends, white. Sold by the case, 200 each (100 pair)/case. 100% high-density polyethylene fibers entangled into protective material with no fillers or thin films to wear away. Breathable protection against hazardous dry particles, aerosols and non-hazardous light liquid splash. Excellent abrasion resistance; protects against small-sized hazardous particles. Elastic at both ends, white. Sold by the case, 200 each (100 pair)/case. elastic at both ends, white. Sold by the case, 200 each (100 pair)/case. Light blue standard weight SBPP shoe covers with elastic tops. One size fits all. Sold by the case, 200 each (100 pair)/case. White microporous material that resists small dry particulates and liquid spray. Provides a high level of protection against non-hazardous dry particulates, light sprays and liquid splash. Passes US and European standards for liquid barrier and bloodborne pathogens. 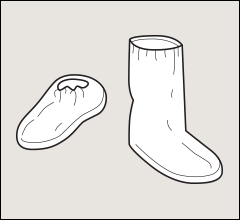 Both the shoe and boot covers have elastic tops, and are only available in one size. Both are sold by the case, 200 each (100 pair)/case. White 100% high-density polyethylene fibers entangled into protective material with no fillers or thin films to wear away. Breathable protection against hazardous dry particles, aerosols and non-hazardous light liquid splash. Excellent abrasion resistance; protects against small-sized hazardous particles. With elastic tops. One size fits all. Sold by the case, 200 each (100 pair)/case.